Minnesota’s Republican governor was in Iowa this weekend in what could be a sort of audition to be John McCain’s running mate. Tim Pawlenty, who is 47 years old and in his second term as Minnesota’s governor, was the main draw for a Saturday afternoon campaign event at the Iowa G.O.P.’s regional campaign office in Ames. Pawlenty pulled a prop out of his pocket — a tire gauge — to lampoon Democratic presidential candidate Barack Obama. "Barack Obama stood up at a speech recently and said that one of the things that is really important from energy policy from his standpoint is to check the pressure in our tires, so here’s a tire gauge and you can go out in the parking lot here and check your tires," Pawlenty said. The crowd laughed. "…We want you to have good pressure in your tires. It will, you know, very mildly add to your fuel efficiency, but checking the air pressure in your tires is not an energy policy for the United States of America." Pawlenty opened his brief remarks with a joke, but then quickly switched to a combative tone. "Voting for Barack Obama for president of the United States, leader of the free world and commander-in-chief is the political equivalent of bungee jumping," Pawlenty said, "especially if you’re a little up there along the way of life and you think it might be a good idea or interesting at the time and then you get the edge of the cliff and look over and you think: ‘This is not such a wise idea.’"
Pawlenty, at the end of his speech, struck a refrain the McCain campaign hammered at in a commercial this past week, that Obama is merely a celebrity like Paris Hilton. 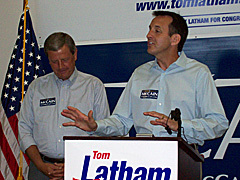 "I’ll just close by saying that we have a chance in Congressman Latham and Senator McCain to elect to these offices two people who are authentic, two people who are deeply committed to public service and are doing it because they feel them have something to contribute, not out of a sense of celebrity or, you know, some other motivation," Pawlenty said. During an interview with Radio Iowa half an hour later, Pawlenty stressed that McCain was "not phony" and Pawlenty offered this observation about Obama. "I think there is a sense, maybe a growing sense that there’s a little bit of cockiness in Obama, that he’s perhaps gotten a little full of himself and also the results and the record don’t square up with the rhetoric," Pawlenty said. "I mean, he’s got this soaring rhetoric, but not many results." Pawlenty was cautious when questioned about the prospect of being McCain’s running mate. "It’s an honor to have your name mentioned amongst many other really fine people, really wonderful people — but I have stopped talking about it because over the weeks and months every time I use one word different than I did the previous day or week then it sets off another round about whether that was something to change the speculation about it all," Pawlenty said, "so I just have stopped visiting about it." Pawlenty talked in general about the campaign and he cited a recent poll which showed McCain and Obama running dead even in Minnesota. A spokesperson for Obama’s Iowa campaign took issue with Pawlenty’s remarks. "With fewer than 100 days before the election, Senator McCain and his campaign continue to take the low road and resort to negative, desperate, and false attacks," Jenni Lee, a spokesperson for the Obama campaign, said in a written statement. "While Senator McCain’s energy plan hands out nearly $4 billion in tax breaks to oil companies and invests almost nothing in new energy sources, Senator Obama’s plan will provide tax rebates to families and create a renewable energy economy in America that will free us from our dependence on foreign oil." You may listen to Pawlenty’s remarks to the crowd in Ames by clicking on the audio link below.